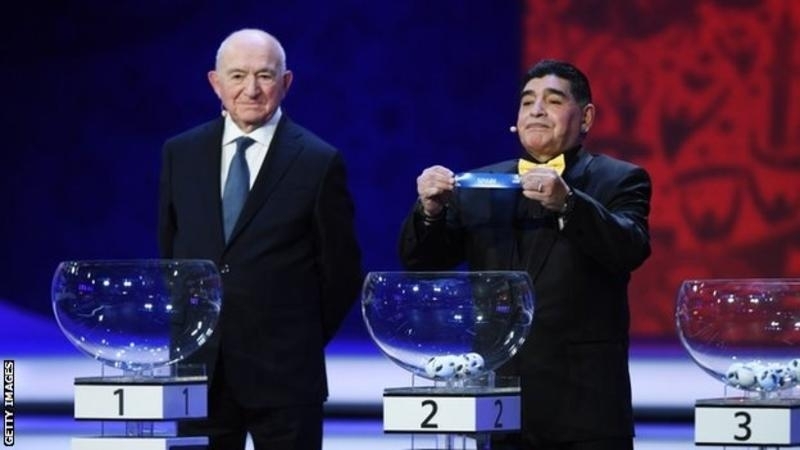 AKIPRESS.COM - Neighbours Spain and Portugal will meet at next year's Fifa World Cup after being drawn in the same group during Friday's draw in Moscow, BBC Sport reported. Champions Germany are in Group F with Mexico, Sweden and South Korea. The opening game of the World Cup will see hosts Russia take on Saudi Arabia in Group A on Thursday, 14 June. Group B sees 2010 winners Spain and current European champions Portugal drawn with Morocco and Iran, who are managed by Portuguese Carlos Queiroz. Portugal captain Cristiano Ronaldo plays with several of Spain's players for Real Madrid and has been managed by Queiroz with Portugal, as well as working together at Manchester United. "It's a big rivalry and it will be like a derby," Portugal and West Ham defender Jose Fonte told BBC Sport. "It will be fantastic. Everyone will be up for it." England have been drawn with Belgium, Panama and Tunisia in Group G.
The hosts' Group A also has Uruguay and Egypt. Lionel Messi's Argentina are in Group D and will open against Iceland. They are also in with Nigeria - the fifth time in the Super Eagles' six World Cups they have been drawn in a group together - and Croatia. Brazil are in Group E with Switzerland, Costa Rica and Serbia. Group C has France, Australia, Peru and Denmark, while Group H contains Poland, Senegal, Colombia and Japan.